You can see the work in progress here (WIP in stitcher's terms) with all of the many veins that a wing as gossamer-y as hers should have. And as I've mentioned in other posts, the blank areas in the first wing are going to be filled in with beads. I do hope I have enough! And yes, I have muttered under my breath these past few months how much I dislike metallic threads. "Dislike" being the public word, since I do carry this product on my website and should probably stand behind it. 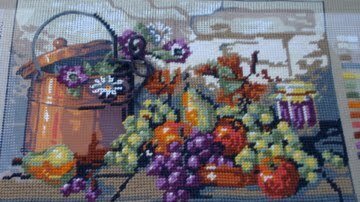 But it is a pain to work with it, every stitcher knows this, and it lends a shimmer to this project that these photos just do not show. It's times like this that I can't believe I've stitched something this intricate and beautiful and just gaspingly gorgeous. Really. I can't. I only have a brief time on weekends to stitch this piece, in part because evenings are taken up with reading and making dinner and other projects. And truth be told, even if I sat down in the evenings and worked on this piece with the magnifier, I know I would not have the patience to finish anything metallic. Not. At. All. In fact, this morning, while drinking coffee out of the new mugs DH bought for our wedding anniversary, I had a new piece of thread + metallic that I had just switched to the double-ended needle, and wouldn't you know, it snapped. Not the DMC thread, mind you, but the filament around which the metallic glorious-ness is wrapped. Imagine what would happen if that took place while I was ignoring dinner preparations around 7-ish on a work night . . . better not. Leave it to say that I would not be a happy camper. So I should have both wings finished by next weekend, beads excluded, and shortly you will see the continuation of these pretty vines and flowers and berries behind her. Then when those are finished, my fairy comes off of her frame and I will stitch the beads with the fabric in-hand. I do have a frame that attaches top-and-bottom, rather than on all four sides (called a Rolaframe), guaranteeing not to smush the glass beads, and I'll use that set-up if the fabric begins to get wrinkled or too difficult to handle with the bead container and needlework. Pick up a bead with the needle, try not to spill the beads . . . that sort of thing. Enjoy your summer, and happy stitching!